Uncommons Maths is Open Source software, free to download and use subject to the terms of the Apache Software Licence, Version 2.0. A Java port of the fast and reliable Mersenne Twister RNG originally developed by Makoto Matsumoto and Takuji Nishimura. It is faster than java.util.Random, does not have the same statistical flaws as that RNG and also has a long period (219937). The Mersenne Twister is an excellent general purpose RNG. A Java implementation of the very fast PRNG described by George Marsaglia. It has a period of about 2160, which although much shorter than the Mersenne Twister's, is still significantly longer than that of java.util.Random. This is the RNG to use when performance is the primary concern. It can be up to twice as fast as the Mersenne Twister. A Java implementation of a Complementary-Multiply-With-Carry (CMWC) RNG as described by George Marsaglia. It has an extremely long period (2131104) and performance comparable to the Mersenne Twister (though the Mersenne Twister has the advantage of only requiring 16 bytes of seed data rather than the 16 kilobytes required by the CMWC RNG). This is a cryptographically-strong1 non-linear RNG that is around 10x faster than java.security.SecureRandom. Reverse-engineering the generator state from observations of its output would involve cracking the AES block cipher. A Java port of Tony Pasqualoni's fast Cellular Automaton RNG. It uses a 256-cell automaton to generate random values. The algorithm is not the only security consideration for RNGs. The source, secrecy and integrity of the seed data is also vital. For highly sensitive applications, consider using something like Fortuna. Using the included probability distribution wrappers, these RNGs (and the standard JDK ones) can be used to generate values from Uniform, Normal, Binomial, Poisson and Exponential distributions. 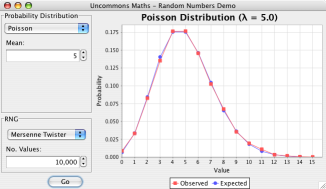 Launch the Uncommons Maths demo application (requires Java WebStart) to experiment with the different distributions. Good RNGs need good seed data. Uncommons Maths provides pluggable seeding strategies, including ones to read random data from /dev/random (where available) and from random.org. Uncommons Maths also includes generics-enabled combination and permutation generators. These are based on Java classes originally written by Michael Gilleland. Uncommons Maths provides a statistical data set class that can calculate a variety of descriptive statistics (variance, median, standard deviation, arithmetic and geometric means, etc.) for a set of values. Uncommons Maths also includes a Rational number type that allows exact fractional arithmetic without loss of precision. Classes for manipulating binary values.